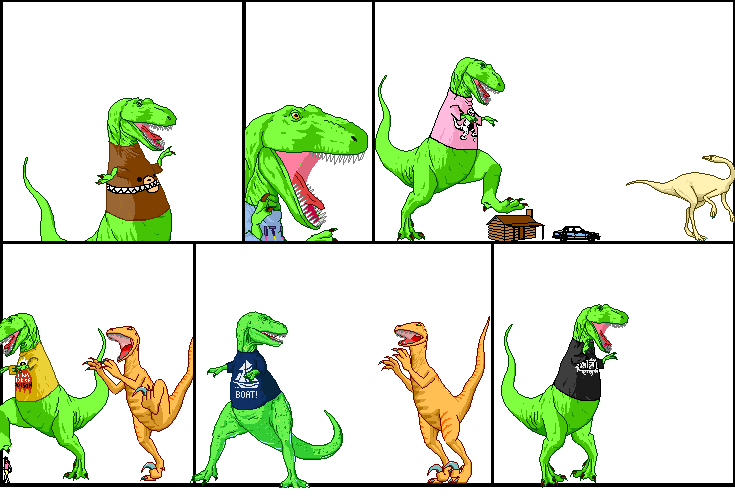 Dinosaur Comics - March 18th, 2009 - awesome fun times! –I AM TOTALLY INTO THIS. March 18th, 2009: I got tons of emails about yesterday's comic, most suggesting the more positive Stayin' Alive as your CPR soundtrack instead of Another One Bites The Dust. I think it's great that we've got these two opposite-themed songs to choose from, but I still think Queen's song is better for CPR though! Another One Bites The Dust has exactly 100 BPM (Stayin' Alive has 103) and the beat in Queen's song is easier to keep in mind and more consistantly at the foreground of the song. Plus, Stayin' Alive has that long "Staying Aliiiii-hiiii-iii-ai-aiiiive" part where it's harder to keep track of the beat!